The connection of the Haftorah to the Parsha: This Haftorah is the second of the three Haftorahs before Tisha B'av that are called the Telasa Dephuranusa - the three of affliction. We read this passage because it explains about the affliction that Jeremiah prophesies regarding the destruction of Jerusalem and the Holy Temple because of the sins of Israel. The storyline of this week's Haftorah: Jeremiah begins this week’s Haftorah by telling Israel that they have abandoned Hashem. The prophet asks on behalf of Hashem "What wrong did your ancestors find in me that they have abandoned me?" The Jewish people didn't say "Where is Hashem who took us out of the land of Egypt, and brought us safely through the desert, into a country with farmland that produced all the food and wealth we needed?" The Kohanim didn't say, "Where is your G-d?" The Prophets falsely prophesied via Ba'al (a Canaanite Pagan deity). Hashem asks, "What’s going on here? Did everyone forget our agreement?” Hashem then continues and says "Go look around, has any nation ever exchanged a living G-d for a false G-d?" Jeremiah warns the Israelites that they have committed two great sins against Hashem. First, they have abandoned Hashem and second, they are worshipping idols. Jeremiah warns the Jews that they will be severely punished. He says that it is their own fault that they are being punished. “Instead of relying on Hashem, you are relying on the Egyptians and the Assyrians for help. You will be in for a big surprise when they don't come and help you when you need them. You will be punished for your sins of unfaithfulness. Israel, you told me that you would be faithful, but you're not. You worship in the Valley of Hinnom, the G-d of Molech doing child sacrifices.” Hashem says, "Stop looking around for allies to save you.” Jeremiah warns the house of Israel, their kings, nobles, priests and prophets, that they will be ashamed like a thief that is caught. They talk to the wooden idols as if they can hear them and they relate to stone as if they gave birth to them, while they turned their backs to me. Yet, in their hour of disaster, they come to me and say, "Save us!" “Now, where are your gods you made for yourself? Let them now come and save you in a time of disaster.” As always the Haftorah ends on a happy note. Hashem says "If you Israel, return to me and remove your abominations from before me, and you do not waver, if you swear “as Hashem lives in truth, justice and righteousness" the nations of the world will bless themselves by you and praise themselves through you. The definition of his name is “Hashem will elevate”. Was born to his father Chilkiya, also a prophet, in 640 B.C.E., about 2650 years ago on Tisha B’av in Anatot, 2 miles north of Jerusalem, in the land of Binyamin. He was born circumcised, a sign of a spiritually elevated person. Was a Kohen and a descendant of Rachav, the Yericho (Jericho) innkeeper that Yehoshua saved. Spoke at childhood, cursing the day he was born. Began prophesying at age 18, continuing for 40 years. Lived in Jerusalem. He never married, and had no children. Was the head of the Mishmeret Hakohanim (The Guard by the Priests doing work in the Holy Temple). They were the custodians of the Ark of the Lord. Known as the Weeping Prophet, for he endured the destruction of the Beit HaMikdash. Symbolically, he wore a wooden yolk around his neck. 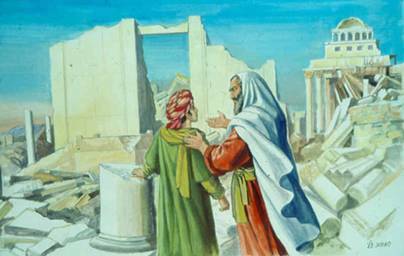 His prophecies took place before, during, and after the destruction of the Bait Hamikdash (Holy Temple). Nebuchadnezzar, King of Babylon destroyed the Temple. He remained in Jerusalem after its destruction with Gedaliah ben Achikam, the man whom the fast of Gedaliah is named after. Shafan was his scribe. Shafan brought the scroll he found in the Beit HaMikdash to Jeremiah, which was originally written by Moses. It was open to the verse "Hashem will bring you and your elected King to a nation unknown to your fathers." That scared people into changing their ways. Some say he was stoned to death either in Jerusalem or after fleeing to Egypt, in Alexandria. Wrote 3 Books: His own, Yirmiyahu (Jeremiah); Eicha (Lamentations), read on Tisha B’Av; and Melachim (The Book of Kings). . The time span of the book Jeremiah was 66 years. Famous phrases: Jeremiah 9:4, “Limdu leshonam, daber sheker." "They have taught their tongue to speak lies." Jeremiah reprimands the people of Israel, who proceed from evil to evil and who, through deceit, refuse to know Hashem. Haftorahman's lesson of the week: It is normal for us to react quickly when there is an emergency. However, once things are back to normal, how many of us make an effort to discuss problems or areas of weakness unless the situation blows up again? We should be aware that Hashem is letting us do what ever we want to do, good or bad. What we must remember as Jews is that we are accountable for our thoughts, words and actions. Hashem has been very patient with regard to our own tolerance for spiritual mediocrity. Why are we waiting for An engraving inside an onyx-stone-eye in a Marduk statue that might depict Nebuchadrezzar II Hashem to blow up at us? Is it only then that we will do what we agreed to do? We should avoid this behavior and learn from our ancestors' mistakes. We should do our best to do what we said we were going to do and avoid paying stiff penalties. Timeline: This Haftorah took place in the years around 3330, 2400 years ago.